While Yuma's earliest recorded history wasn't until the 16th century, the first inhabitants were members of Native American tribes that gathered along the banks of the Colorado River. These were the Quechans, the Cocopahs, and the Mohaves. Until the early 1950's the Quechans were known as Yumas, which in all probability led the Territorial Legislature to give Yuma it present name. History has it that the Yuman Indians built fires, in the belief that rain would come to the area. The word uma means fire, thus the name Yuma. About 3,000 Yuma Indians lived in the Southwest in the late 1600s. They were active tradesmen. They brokered shells and fishhooks from the Pacific Coast tribes in the West in exchange for baskets and pottery from tribes in the East. Although a sedentary people, the Yuma were physically superior to most of their Indian brethren. The Yuma were competent farmers despite the hot climate. Dreams were an important part of Yuma ceremony and rituals. The Yuma cremated their dead. About 3,000 Cocopah lived in the Southwest in the late 1600s. They were not aggressors, but did not mind mixing it up with neighboring tribes if attacked. In the hot summer months they lived in brush houses; during the winter they built mud huts. Game was not plentiful where they lived so they turned to irrigated farming. They also were competent fishermen and did some gathering of wild seeds, roots, and beans. .
About 2,000 Maricopa lived in the Southwest in 1680. They were closely related to the Yuman. These two tribes had a falling out, and the Maricopa moved from the Colorado River Basin to live near the Pima, just west of present-day Phoenix. Despite speaking different languages, the Maricopa and Pima got along well as both grew crops along the Gila River. In about 1760 the Yuma, Cocopah, and Maricopa Indians formed one tribe known as the Coco-Maricopa ribe and lived on the Gulf of California, near the mouth of the Colorado River. These colorful and diverse tribes set the stage for a city rich in American culture and tradition. Yuma's colorful recorded history first began in 1540 when the Spanish explorer, Hernando de Alacon became the first white man to visit the town's present site. From this time forward, until 1854, Yuma was under the flags of Spain and Mexico. In 1854, under the Gadsden Purchase, Yuma became a territorial possession of the United States. Because of its location where the Colorado and Gila Rivers converge, in the 1850's Yuma became a major river crossing for early California gold seekers, as well as commerce being shipped east and west. A river town is born. With the founding of Fort Yuma in 1849, steamboats soon traveled up the Colorado River from the Gulf of California, carrying goods to support the fort, as well as other military posts in the state and with these goods came people from a variety of backgrounds and interests.From the 1850's through the 1870's, steamboats on the Colorado River transported passengers and goods to various mines, military outposts in the area, and served the ports of Yuma, Laguna, Castle Dome, Norton's Landing, Ehrenberg, Aubry, Ft. Mohave and Hardyville. During this time stagecoaches also carried the mail and passengers on bone-jarring rides through the area. For many years, Yuma served as the gateway to the new western territory of California, which brought thousands from around the world in search of gold, or those who had it. In 1870, the Southern Pacific Railroad bridged the river. 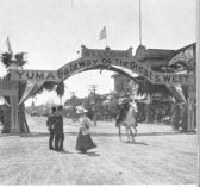 Yuma became a hub for the railroad and was selected as the county seat in 1864. During this time Yuma was known as Colorado City, then in 1862 the city was renamed Arizona City. In 1873, the Territorial Legislature renamed it Yuma. With any sign of prosperity comes the challenge of law and order in the 1870's, Arizona had become an integral part of the Wild West, and bandits and renegades preyed upon the civilized folks who had come to start a new life. The Yuma Territorial Prison was the first state penitentiary in Arizona. On July 1, 1876, the first seven convicts entered the prison. Over the next 33 years, the prison would become home to 3,026 convicts. The prison was under continuous construction, with labor provided by the prisoners. When the prison ran out of land to build on, a new facility was built in Florence. On September 15, 1909, the last prisoners were transferred to Florence.